Your vision is measured by your eyesight prescription. This is a gauge to how well you can see. Should you have less than 20/20 vision, you will be prescribed glasses or contact lenses. As a rule of thumb, the higher your prescription, the worse your eyesight is. A prescription is determined by assessing how powerful your cornea (outer part of your eye) and your lens are. The lens is positioned inside your eye itself. If either one is too powerful or weak, blurry vision can and does occur. Our eyes see all objects in light and contrast terms. If your cornea and lens are working as they should do, the light will hit your retina spot on. This image is then sent to your brain via the optic nerve. The brain then makes sense of what you are seeing. If you are suffering from long or short sightedness, then light is focused behind or in front of your retina. This is how blurry vision occurs. Myopia occurs when the eye’s focusing power as a whole is too strong for its size. As a result, light lands in front of the retina instead of landing precisely on the retina and objects which are far away appear blurred. Prescriptions for Myopia are normally measured in minus numbers. This is commonly first noticed in your teenage years when, for example, the blackboard becomes hard to see. Using Lasik eye surgery, the curve of your cornea is made flatter. This alters the path of the light so that it hits your retina directly correcting your vision. If you suffer with severe short sightedness (your prescription is over -10.0) then laser eye surgery will not be able to help. Refractive lens exchange or implantable contact lenses however, can still help give you prefect vision. If the power of your cornea and lens are too weak, the light falls behind your retina. 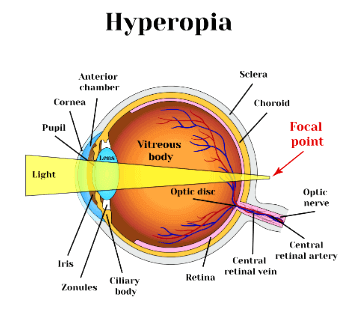 This condition is called Hyperopia. In essence, your eye’s focusing power as a whole is too weak for its size. This causes light to appear behind your retina. Though the belief is that long sighted suffers can see objects far away this is not always the case. It is normally measured in positive numbers in an eye prescription from your optometrist. Age: Younger people often will be able to see clearly as the eye muscles can compensate for light landing behind it. As the eye is under stress to compensate for the weakness, younger people will often be able to see clearly but may suffer headaches and eyestrain. As we get older, our eye’s ability to compensate for hyperopia degrades, and close up vision, followed by long sighted vision, becomes blurred. Severe Long Sightedness: If your long sightedness is extreme then you may well suffer blurry vision at an early age. Using either Lasik or Lasek eye surgery the curve of the cornea can be made steeper. This results in the light hitting your retina directly and correcting your vision. 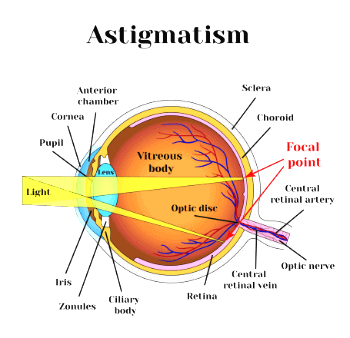 Astigmatism is a vision error that causes blurred or distorted vision. With astigmatism, the curve of your eye horizontally will be more or less powerful than the curve of your eye vertically. This results in distortion of the light and blurred vision. In essence, the shape of your eyes is not perfectly spherical, and this causes the light to deviate from its true path. A variety of vision correction treatments can be used to correct astigmatism correcting the path of light as it enters your eye, thus ensuring clear vision. As we get older, like the rest of our body parts, our eyes start to lose their effectiveness. This condition is called Presbyopia and is a natural part of the aging process. It is often first experienced by men and women aged between 40 to 45 years old. Typically, objects close to us become blurred and is at this point we need reading glasses. The lens of our eye puts objects in focus like the zoom on a camera. Using ciliary muscles in the eye, the lens adjust focus automatically. It is something we take for granted. To see things further away, our lenses become flatter. To put things into focus, the lens needs to be more rounded. The ciliary muscles work the lens into this round shape. When Presbyopia occurs as we age, the muscles lose their effectiveness and your lens becomes harder. As the lens can no longer change shape as easily, objects close to us appear blurred and the need for reading glasses arises. To treat this condition we can use implantable contact lenses or lens replacement surgery, correcting both close and distance vision. If you would like to find out more about the range of vision correction treatments available at Advanced Vision Care, then why not call AVC TODAY on 0800 652 4878 and request your free information pack or book your consultation to find out how we can help you.